Scientists at EPFL's Laboratory for Processing of Advanced Composites (LPAC) and the University of Freiburg's Botanical Garden have studied how the flax plant heals itself after it has been wounded. As part of a cross-disciplinary EU research project, they measured changes in the plant's mechanical properties, like stiffness and damping, and examined the plant's self-repair mechanisms. Because natural fibers are being increasingly used to make composite materials, understanding how such mechanisms work can help scientists develop self-healing materials with better performance, drawing on methods inspired by nature. The research was recently published in PLOS ONE. Imagine car paint that can automatically repair itself after a scratch, or a corrosion-resistant coating that can automatically restore itself after being chipped off. These are just two of the promising new applications for self-healing materials – although numerous obstacles remain. "Each type of material poses a different challenge," says Véronique Michaud, one of the study's authors and head of the LPAC. "Some materials can already regenerate thanks to a system of liquids inside them. If the material is scratched, the liquid flows out and reacts with the surrounding air, for example, to fill in the scratch. It's similar to how your blood coagulates if you cut your finger." But other materials are more complicated, and progress is still at the laboratory stage. That's especially true for composite materials, which are used in aircraft and sporting equipment – and are the focus of the scientists' work. Out in the wild, plants must deal with a variety of stresses such as wind, rain and breakage. That's why the scientists decided to study how the stems of flax plants change after they've been cut. "We chose flax because its fibers are already used to make composite materials, and because it's a common plant that grows quickly," says Michaud. They made lengthwise and crosswise incisions in the stems of two different families of flax plants and let them grow for 25 days next to plants that hadn't been cut. They then measured changes in the stems' stiffness and damping properties. The scientists, which included EPFL researchers and a biology post-doctoral researcher from the University of Freiburg, applied a dynamic tensile load to the stems to measure the amount of force necessary to strain them and their temporal response both on intact stems and self-repaired ones. Stiffness and damping are also properties that researchers continually strive to improve in materials; they must always find the right trade-off between these two factors, whether the aim is to avoid uncomfortable vibrations in a car, make sure a bicycle can ride smoothly over bumps or develop a responsive tennis racket. The testing methods and machines that the scientists used in their research on flax stems are the same as those used to test composite materials. The scientists also looked at how the stems healed from the incisions. They found that the response was different depending on whether the incision was lengthwise or crosswise. For lengthwise incisions, the plant cells surrounded the wound and created a sort of skin, but the stem did not regenerate. However, for crosswise incisions, the cells filled in the space created by the wound and healed it almost completely; the regenerated plants recovered 95% of their mechanical properties. 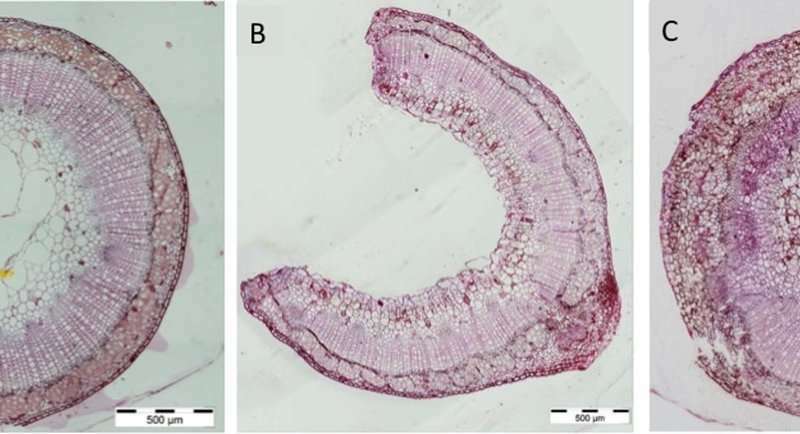 Other tests carried out at the University of Freiburg showed that self-healing results can vary according to the kind of plant and the severity of the damage for both the plant and its survival in its habitat. Self-healed plants were found to not grow as tall as their intact counterparts, but they did form flowers and seeds. 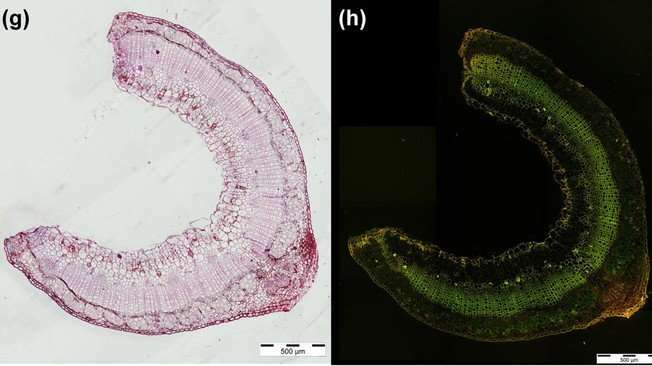 This study marks the first time that scientists have quantified the flax plant's mechanical properties and ability to regenerate. It is also the first time that LPAC researchers carried out tests on plants using equipment designed for studying synthetic materials. The researchers hope to continue drawing from mechanisms occurring in nature to propose new strategies for creating composite materials.